Side dish for breakfast, lunch, or dinner. 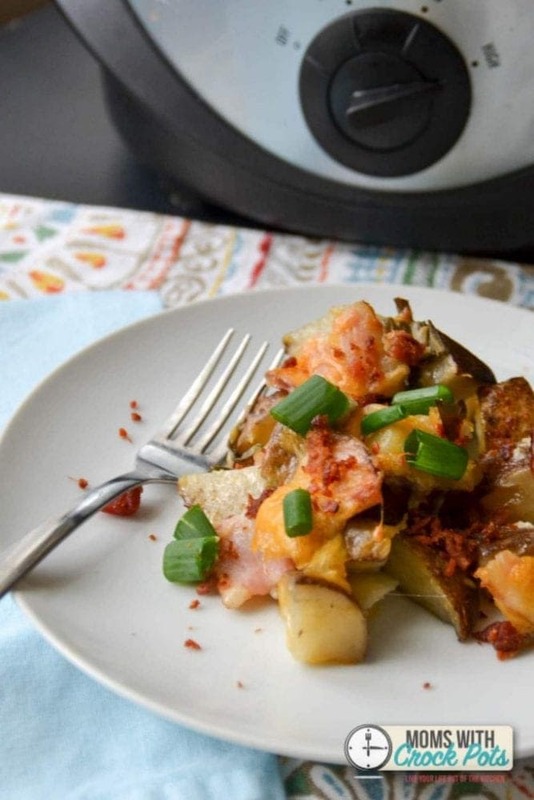 You have to try this simple Crockpot Bacon & Cheese Potatoes Recipe. It’s the best! This is one of our most popular recipes and it is full of flavor. Such a great side dish you have to give these Crockpot Bacon & Cheese potatoes a try! They are delicious as a side dish for dinner or part of a brunch. A love easy crockpot recipes like this! 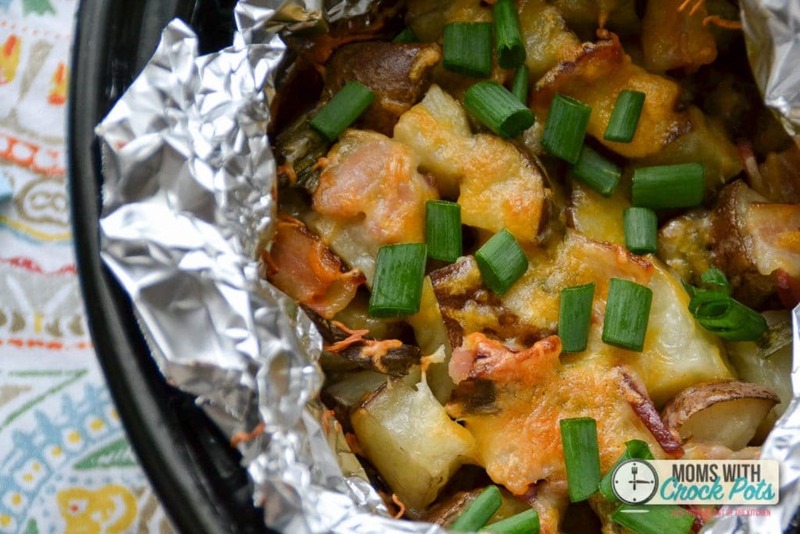 Just layer the potatoes, bacon, and cheese along with some green onions right in a foil-lined slow cooker. Cover by folding over the foil or place another piece of foil. Cook on high for about 5 hours or low for 8 – 10 hours. The foil prevents the bottom of the potatoes from getting burned and also makes clean up a breeze. 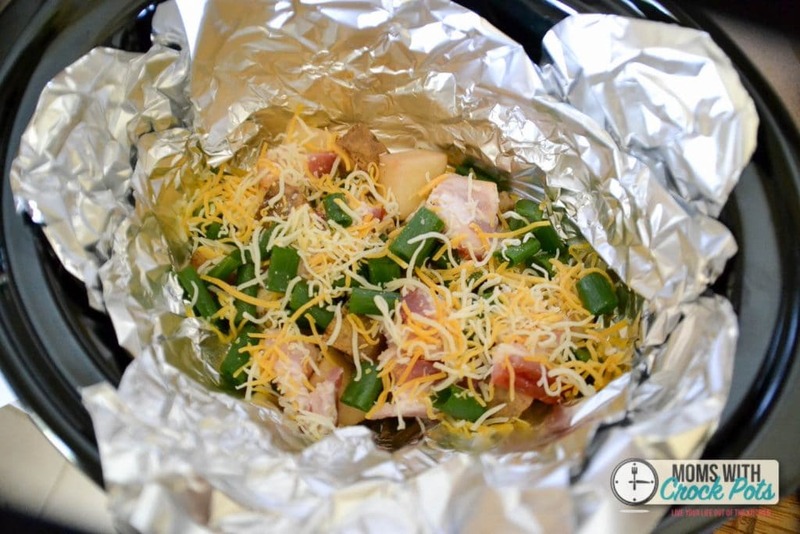 You could substitute parchment paper if you don’t’ have or want to use foil. This dish is best prepared in a 4 qt or larger crockpot. You can double this recipe easily, but you will want to use at least a 6-quart crockpot if you do. Make this recipe bigger if you are expecting company. Great to serve for a brunch! is the bacon cooked or uncooked when you add it to the crockpot? why do you line with aluminum foil? Helps them not to stick, and you wrap the extra over the top like a steam pouch. It helps them cook. Anyone else run into the issue of burned cheese?? Yes I cooked last night for our Easter dinner and I have some burned onions and burned cheese. Definetly could cook it for less time. Is it ok to use shredded cheddar, or do you have to have slices? Ohhh… this recipe looks divine!!! I’ll make this over the weekend! I love potatoes!! Can you cook on high for a shorter time? Or will they burn? Whenever I make bacon for recipes, I like to make it in the oven to make it crispy since it will soften somewhat while its added to the dish. Does this work if you use Turkey Bacon? I prefer not to bake in foil. Has anyone tried this without the foil but spraying the sides? I love the idea of these for Sunday brunch! You can also use those Parchment paper bags instead of tinfoil. WOrks just as well! Does it REALLY brown like this? I’m with Pam, I’d love to make these tonight but I don’t have 10-12 hrs. Can I do high for 6? This recipe looks great and easy! I love potatoes and onions and cheese! It’s making me hungry now. I too, wanted to try these, but didn’t have the time to wait for the time in the crock pot. So I followed this recipe, except for I did it in the oven at 400 degrees for an hour in a 9 x 13 baking dish covered tightly by aluminum foil. They came out AMAZING!! Thanks for the recipe. Thank you for sharing this…I was looking for a shorter cooking time and this was perfect! Has anyone had any experience in making the mixture and then freezing it before cooking? I am trying to start freezer cooking and this looks as though it would be something I would make often but don’t have the time to prepare each time we want to eat it. These are way too tasty! Loved them! Has anybody made them on high? Also, do you add the green onion in with the other onion or wait until the very end to add them? just made this and inprovised with the oven, hope it turns out good. I didn’t cook the bacon & thought it was awesome. Love not having deal with the bacon cooking mess. I used a combination of Red & Yukon Gold potatoes that equalled a total of 2 lbs., 1 cup of shredded Cheddar cheese, only green onions, no salt or butter (thought bacon added enough salt). I added a little sour cream to some of mine to make it like a loaded potato but hubby felt like they didn’t need anything. We had this as a meal for two & still had a few leftovers. Will be making this again for sure. Sorry forget to mention above that I used the oven recommendation for 1 hr @ 400 degrees and it worked perfectly. Can you make in the oven?? Dont have a crockpot and would really like to try this before the cooking inspiration leaves me! Got these potatoes in the oven as I’m typing this. Smells heavenly!!! I just started this is one crockpot and the Sour Cream and Bacon in another. I can’t wait to see how they turn out! Everything turned out wonderful! I will definitely be making them both again. The chicken was tender and the potatoes were delicious. Great dinner! Thanks so much for the tip of using foil when cooking potatoes in the crockpot! This recipe sounds wonderful. Great weeknight dinner idea and economical too!